Mini Size Spy Camera - Easy to hide.Has a monolithic housing and rear panel with hidden memory card slot; no indicators, no sounds, no one will know that there is a camera in the room. Full HD Lens - AOBO Spy Cam with 150°Wide-angle and 1080P video solution,Has IR night vision features, allowing you to record more details and bring you a more clearer video image . Strong Magnet Body - AOBO small spy cameras built in magnet,can be adsorbed on iron material, easily fixed anywhere. 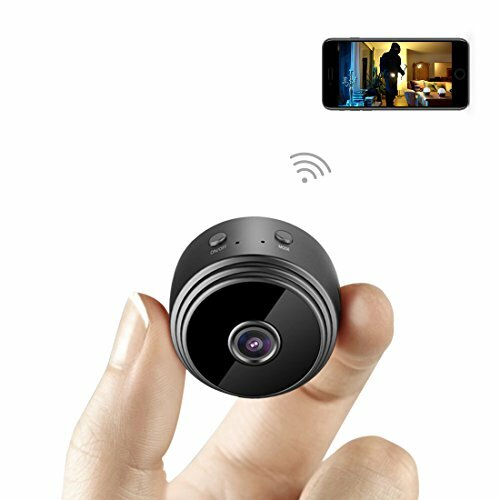 Motion Detection Alarms - You will get real-time alerts when wifi spy camera detect motion,letting you know what’s going on there. Guarantee Service - Full 1-Year AOBO manufacturer warranty,Lifetime service provided directly from AOBO.Professional service Support 24⁄7 online to assist with any needs.